Jun 30, 2015 • [Source: ESA] Just four days after being lofted into orbit, Europe’s Sentinel-2A satellite delivered its first images of Earth, offering a glimpse of the ‘color vision’ that it will provide for the Copernicus environmental monitoring program. With a swath width of 290 km, the satellite’s first acquisition began in Sweden and made a strip-like observation through central Europe and the Mediterranean, ending in Algeria. The data were relayed in real time to Italy’s Matera ground station, where teams eagerly awaited their arrival for processing. 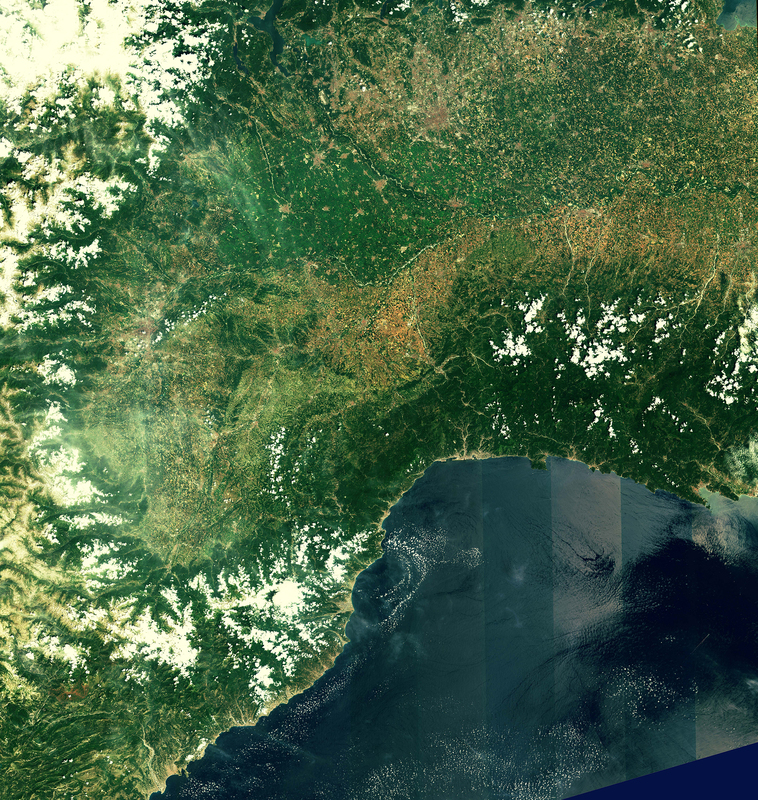 While northern and central Europe were mostly cloudy, Italy’s typical sunny weather allowed the teams to get their first glimpse of the multispectral instrument’s capabilities over the northwestern part of the country and the French Riviera – and they were excited by what they saw. With a ground resolution of 10 m per pixel, the images show individual buildings in Milan, agricultural plots along the Po River, and ports along the southern French coast. “This new satellite will be a game changer in Earth observation for Europe and for the European Copernicus program,” said Philippe Brunet, Director for Space Policy, Copernicus and Defence at the European Commission. 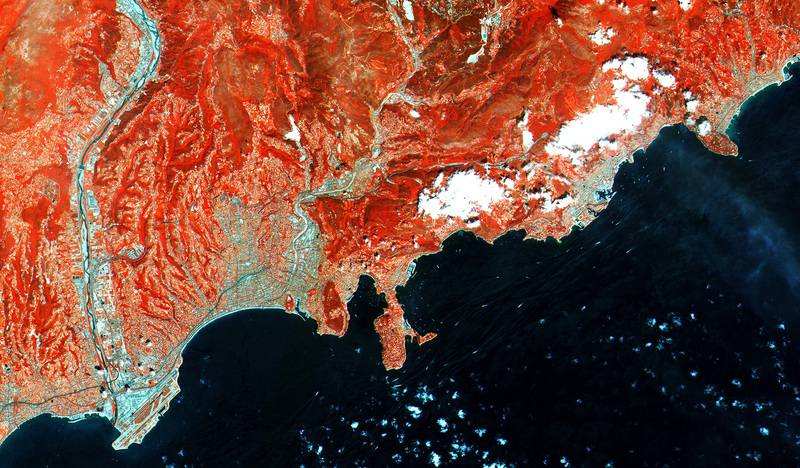 Acquired on 27 June 2015 at 10:25 UTC (12:25 CEST), just four days after launch, this close-up of France’s southern coast from Nice airport (lower left) to Menton (upper right) is a subset from the first image from the Sentinel-2A satellite. This false color image was processed including the instrument’s high-resolution infrared spectral channel. The multispectral imager is being calibrated during the commissioning phase – which will take about three months to complete – but the quality of these first images already exceeds expectations. In addition to demonstrating the imager’s high resolution, these initial data also foreshadow the mission’s land-monitoring applications in areas such as agriculture, inland and coastal waters and land-cover mapping. The imager’s 13 spectral bands, from the visible and the near infrared to the shortwave infrared at different spatial resolutions, take land monitoring to an unprecedented level. In fact, Sentinel-2 is the first optical Earth observation mission of its kind to include three bands in the ‘red edge’, which provide key information on the state of vegetation. This weekend’s activities also demonstrated that the operational processor works flawlessly, paving the way for the mission’s systematic data generation to come. Sentinel-2A is the second satellite for Europe’s Copernicus programme, following the Sentinel-1A radar satellite launched last year. Designed as a two-satellite mission, Sentinel-2 will provide optical imagery on a five-day revisit cycle once its twin, Sentinel-2B, is launched in 2016.